Copy numbers. When we discuss structural genomic variants in the human genome on the Channelopathist blog, we usually refer to regions where simple deletions or duplications exert a pathogenic effect. However, there are also genes that are highly copy number variable, sometimes present at 80 copies or more. Copy numbers of a few of these genes have expanded during human evolution recently, turning these genes into potential candidate genes for human disease. A recent paper in PLOS Genetics now examines the role of DUF1220, which encodes a protein domain of the NBPF genes. This domain shows an unusually broad range of copy number variation in the human genome. Interestingly, this gene resides right next to the 1q21.1 region that is implicated in various neurodevelopmental disorders. Lineage and breakpoints. When gene expression in humans and chimpanzees was compared for the first time in 2005 and when the first chromosomes of the chimpanzee genome were first sequenced, I was a little disappointed. I had naively expected that comparing humans and great apes would naturally point towards a particular class of brain-expressed genes that made us human. However, the real differences were found in immune genes, highlighting our constant evolutionary struggle against parasites. The brain, however, came back in to play again when particular classes of genomic variation were compared. For example, for genes amplified in segmental duplications, there was a strong focus on brain-expressed genes. In addition, other genes that are highly copy number variable were boosted during recent human evolution. The DUF1220 domains belong to this group. DUF1220 is not a gene by itself, but a segment encoding roughly 65 amino acids that is found in the neuroblastoma breakpoint family (NBPF) genes. This gene family is located within a segmental duplication region in the 1q21.1 region. The role of DUF1220 and NBPF is not known. However, the rapid expansion in the human lineage is remarkable. Figures from the publication by Davis and collaborators. DUF1220 dosage is distributed in patients with autism spectrum disorders (ASD) in an almost Gaussian fashion, which is not much different from what is expected in the general population. 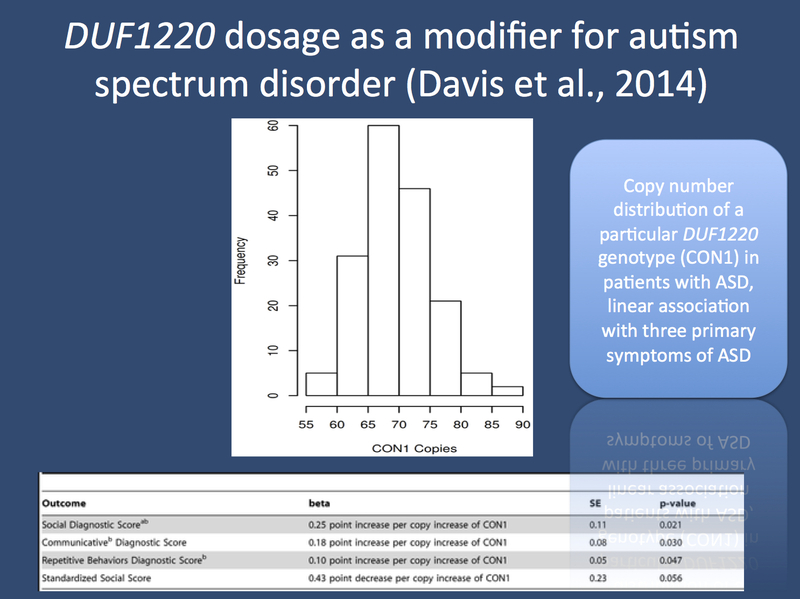 However, there is a linear correlation between DUF1220 dosage and various ASD-related features including measures for social deficits, communicative impairments, and repetitive behaviors (figure adapted from the publication by Davis and collaborators under a Creative Commons License). DUF1220 and autism. In a previous publication, the authors had already suggested that DUF1220 copy number variants may partly be responsible for the neurodevelopmental phenotypes of patients carrying 1q21.1 microdeletions and microduplications. In their current publication, Davis and collaborators focus on DUF1220 copy number variants and autism. At first glance, their result is disappointing. When comparing 170 patients with autism spectrum disorder to the distribution expected in controls, they do not find a difference: the distribution of DUF1220 copy numbers has a nice Gaussian distribution. However, when the authors focus on more subtle phenotypes such as quantitative measures of social deficits, communicative impairments and repetitive behaviors, they find a linear association with DUF1220 dosage. This suggests that –while not directly causative- DUF1220 dosage may have a modifying effect on ASD severity. Lessons learned. Given the unusual mechanism and the strong evolutionary framework of DUF1220 dosage, this is an interesting finding that highlights a class of genomic variation that has not been analyzed in detail yet. We usually shy away from segmental duplications and highly copy number variable genes as these parts of the human genome appear to be unpredictable and hard to analyze. The study by Davis and collaborators suggests that the highly dosage variable parts of the human genome might be relevant targets for various neurodevelopmental disorders including epilepsy. This entry was posted in 2014, human evolution, Papers and tagged autism spectrum disorder, AUTS2, chimpanzee, communicative impairments, Copy Number Variations, DUF1220, Gaussian distribution, gene expression, human evolution, NBPF, neurodevelopmental disorders, repetitive behavior, segmental duplication, social deficits, the human genome. Bookmark the permalink.